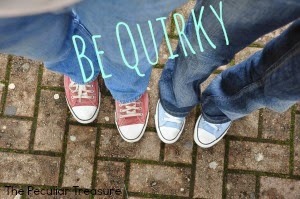 Quirks: a peculiarity of action, behavior, or personality. Part of the reason this blog is named "The Peculiar Treasure" (other than the Bible verse in Exodus it's named after) is because I know that I am odd. I like ketchup on my well-done steak, I still check every closet in the house for serial rapists when I'm home alone, and I cannot stand it when people say "and what-not". I am OCD about the rear-view mirror in my car and if anyone moves it, I will sit for 10 minutes trying to get it back to "where it goes". So why exactly does it rock to be quirky? Because all quirky really means (in my mind) is that you are distinctly you. No one in the world is exactly like you. You have flaws that need fixing, sins that need forgiveness, habits that need breaking, but you also have wonderful traits that are specific to you. Maybe you are boisterous and outgoing, and maybe some people find it obnoxious, but everyone needs a person that will break the ice and make every person who walks into the room feel welcome. Maybe you are super quiet and your mom wishes you would "make your presence known", but someone out there will appreciate the fact that you filter your thoughts and don't just spout off whatever you think. And maybe you don't believe in driving a car because of the pollution they cause. Well, you will be in way better shape than I am (with all the walking or bike riding) and the fact that you care about the planet so strongly is a valued quality; something that millions of people could learn from. The point is, rock out your quirkiness. Wear those pants that look like they just shot out of the 70's. Sing only African-American 60's music and tell your friends you can't stand that Meghan Trainor song! It's okay to have opinions and it's okay to be you.